Bladder tumor or bladder cancer is found more in the men, rather than the women. It could be because, the men smoke more and probability of the men working in the manufacturing industry is more. The usual symptom of the bladder tumor or the bladder cancer is the blood in urine. The patient experiences no pain, while it happens. So, one should visit the doctor, immediately after this symptom is experienced. The basic diagnosis done for the bladder tumor or bladder cancer is the cystoscopy. In this procedure, flexible tube that consists of the camera and also certain important instruments is used. It is inserted inside the bladder, though the urethra. This diagnostic method is called gold standard for diagnosing for bladder cancer. Home diagnostic method is also possible, through NMP22. This is a non-invasive diagnosis and the test is analysed through H-related protein, which is a human complement factor. There is also another non-invasive method of diagnosis called CertNDx. Still the other ways of diagnosis are fluorescence cystoscopy that is guided through Cysview or Hexvlx. These tests are performed through fluorescence cystoscopy guidance and are also called photodynamic diagnosis or blue light cystoscopy. The procedure detects the cancer in the bladder and then rate early tumor recurrence rate can be reduced, when compared to the only white light cystoscopy tests. Cysview, especially reduces the recurrence of the cancer in the bladder and detects more cancer. Cancer that starts in the bladder is classified into many types. Treatment is recommended according to the type of bladder tumor or cancer. For non-muscle-invasive bladder tumor or cancer, the treatment is needed to be performed to remove all the cells that are cancerous and the rest of the cells of the bladder are left intact. 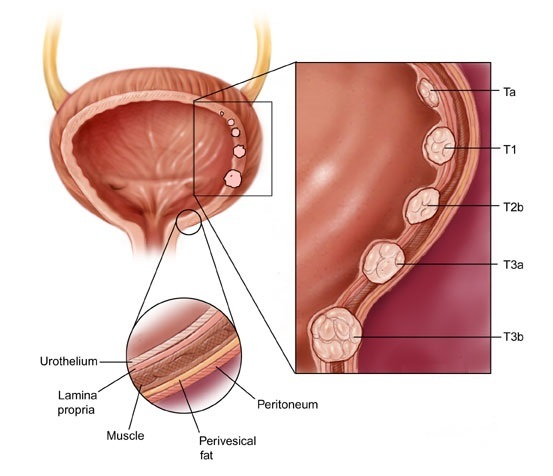 The removal of these cells is done through TURBT or Transurethral Resection of a Bladder Tumor. Before the TURBT treatment is started, chemotherapy medication is provided to work direct internal to the blader, so that the risk of the affect and possibility of returning of the cancer cells will be can be reduced. In the cases, where the there is much more possibility of recurrence of the cancerous cells, BCG or Bacillus Calmette-Guerin is recommended to be injected inside the bladder and the result will be of reduction of the risk of the cancerous cells to be returned. Cystectomy is another treatment needed for a specific condition called non-muscle-invasive bladder tumor or cancer that is highly risky. This treatment may need the removal of the bladder, in the specified operation. In this kind of surgery, after the bladder is removed, there must be an alternate way to drain out the urine from the body. There are multiple possible options available. One option is to make a new alternative opening at the abdomen so that urine is moved towards a newly set external bag. And the other option is to construct a new bladder near the bladder section. Arrangement of alternate to the bladder is done during the process of cystectomy operation. There is also another condition, n which the removal of bladder cannot be recommended for certain body health conditions. Or sometimes, the general health of the patient does not allow performing the surgery. In such conditions, doctors recommend chemotherapy and radiotherapy. Chemotherapy is also treatment procedure, which is used as part of the other treatments. For example, chemotherapy is needed to be done before the surgery is performed. Sometimes, it is needed to be done in combination with the radiotherapy.